You know that chocolate peppermint bark that seems to be Everywhere around the winter holidays? This is an ode to that candy in cookie form. The cookie is the same as my Chocolate Mint Cookies (which are my take on Girl Scout Thin Mints). The difference here is the dark and white chocolate and crushed peppermint candy topping. Note that I call for peppermint oil, not extract. It is much more potent and has a very true peppermint flavor. You can order from LorAnne Oils, or find it at Whole Foods or some Michael’s craft stores. FOR TOPPING: Melt each chocolate separately in top of double boiler or microwave and stir until smooth. Stir 1/4-teaspoon vegetable oil into each melted chocolate. Let cool 5 minutes until slightly thickened then pour each chocolate into a parchment cone. Snip small opening in cone’s tip and drizzle white chocolate back and forth over cookies to create a thick zigzag pattern. 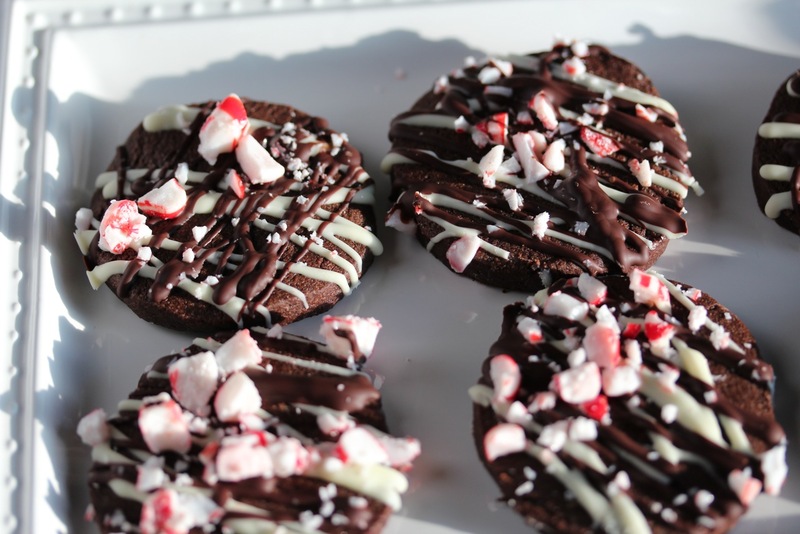 Repeat with dark chocolate then quickly, while the chocolate is still wet, sprinkle generously with peppermint all over the cookies. Place baking sheets in refrigerator for 10 minutes or until glaze is set. Remove cookies from pans and store in an airtight container separated by sheets of parchment or waxed paper. Store in refrigerator until needed, up to 1 week. Serve at room temperature.